I WAS BORN IN MOSCOW to Benjamin Zuskin and Eda Berkovskaya, both actors in the Moscow State Jewish Theater. My father, Benjamin Zuskin, was an outstanding actor. When during the World War Two the Soviet authorities had established the Jewish Anti-Fascist Committee, Father, as an eminent Jew, has been appointed Committee’s member, and later, executed upon false charges – together with a few other Committee members. My mother and I were exiled to the Siberian part of Kazakhstan. Back in Moscow, I was graduated engineering studies, as an MSc (1961), and also qualified as a translator and information expert with an MA (1962), worked in these fields, and raised the family. 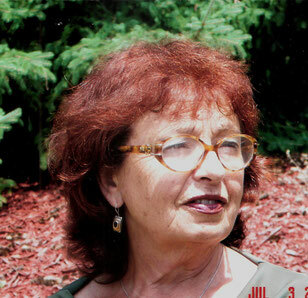 I immigrated to Israel in 1975 with husband Yuri Perelman and two sons, Alexander and Benjamin. Now I have five grandchildren. For two decades, I ran the Information Center at The Standards Institution of Israel. This included, in addition to ongoing in-house responsibilities, also activities in various international projects. The theater art scholars and large public in Israel, Russia, USA, Italy, Holland, and Germany——in person or by correspondence. The last almost two decades I was busy with collecting, all around the world, information concerned with my father, compiling it with my own and other’s remembrances, writing about him the book in Russian (released in 2002), rewriting it in Hebrew (released in 2006), and carrying for its translation into English (released in 2015). These publications were followed with presentations, meetings, lectures, all kinds of correspondence, etc. The English version of the book has been for the first time publicly launched by me at the event in New York City. What made this year’s Remembrance of the August 12, 1952 Night of the Murdered Poets Memorial held at the Center for Jewish History unique, was the presence of Ala Zuskin Perelman , daughter of murdered Yiddish actor Benjamin Zuskin. Following greetings by event host Shane Baker , Director, Congress for Jewish Culture, YIVO Executive Director Jonathan Brent delivered a scathing indictment of the Soviet Union’s Stalinist tyranny. I had met Erlich and Alter as a child in pre-war Warsaw. My mother and I traveled with Erlich’s wife Zofia and son Viktor across Siberia [to Japan] and sailed with them on the “Heian Maru” to the U.S. unaware of their fate. I was also witness to the arrest of my father in Vilno when at dawn in August 1940 two black-leather coated NKVD agents [precursor of the KGB] and two bayonet bearing soldiers broke into the house we lived in— a few blocks from the YIVO’s building. My father [Matvey Bernsztejn) would later share a Lukishki [Vilno] prison cell with Menachem Begin before each was sent to Stalin’s gulags. In a rich Russian-accented English, petite Zuskin Perelman — author of the biography The Travels of Benjamin Zuskin — stood at the dais and recalled her father’s life as behind her film clips of his performances were showcased on a large screen. Touting his multi-talented accomplishments she elaborated on scenes from a Yiddish production of King Lear and a fragment from Goldfadden’s Yiddish operetta The Witch (aka Di Makhasheyfe, Di Koldunie). The evening concluded with actress, singer Yelena Shmulenson ’s exquisite renditions of, among others, Di Alte Kashe/Nit Bashert (The Old Question/Not intended/promised) words Sholem Aleichem; music L. Pulver); Birobidzaner Viglid (Birobidzan lullaby [Birobidzan was USSR’s Jewish Autonomist Colony] words by I. Fefer music R. Boyarska) and A Hoikher Boym (A Tall Tree) Words: Shike Driz, Music: M. Poliansky. Her accompanist, pianist Steve Sterner.